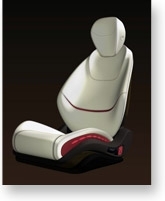 LOS ANGELES -- Auto supplier Faurecia SA is refining its concept of a better car seat to not only create an interesting design, but to design something that can actually be made at high production levels. The company worked with BASF AG on a new nylon blend that will allow Faurecia to use injection molding to make a new type of seat, which would replace much of the metal, foam and fabrics with a two-piece plastic structure. It debuted its concept seat, the Sustainable Comfort 1.5, at the Los Angeles Auto Show on Wednesday. While it does not have any contracts in hand, the company could be ready to begin production by 2014, said Greg Brncick, innovation manager for Faurecia's seating products group, in a Monday interview. Faurecia, with global offices in Nanterre, France, and North American headquarters in suburban Detroit, showed a version of the Sustainable Comfort seat as part of its 2008 auto concepts, noting that it would be 17 percent lighter and up to 30 millimeters thinner than a traditional front seat. While the company is not giving specifics on its 1.5 version, it still expects to meet or beat those targets. The weight savings will be important to automakers who must meet higher fuel economy standards. Thinner seats provide car designers with the ability to make smaller cars more comfortable by reducing the space taken up by seats. “The amount of mass we can reduce is going to be very important,” Brncick said. Faurecia ranks No. 8 on the Automotive News list of the top 100 global suppliers with worldwide sales to automakers of $17.7 billion in 2008. A traditional seat uses a structural steel skeleton along with wire and polyurethane foam to shape the seat. Faurecia's concept marries two plastics, with an inner layer of a compression molded continuous-fiber-reinforced thermoplastic for its “performance cushioning” and an injection molded seat back, said Amit Kulkarni, innovation manager with Faurecia's North American offices. 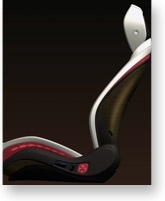 The design resembles the cushioning of an athletic shoe, and Faurecia plays that up with LED lighting within the seat. “It takes the seat back to the next level,” Kulkarni said. A traditional seat is either covered with textile or has a decorative plastic trim, Brncick said. Faurecia's seat is both functional and decorative.